The Commelinaceae is a family of 40 genera and over 600 species of monocotyledenous flowering herbs, distributed from Northern temperate to tropical climates. Some species native to climates that are periodically dry or cold use thickened roots or tubers to survive. Succulence is common and stems may be thickened often with nodal swellings. The alternate simple parallel-veined leaves sheath the stem at their base. Sap may be slimy and mucillaginous. 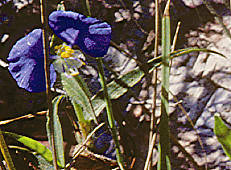 The short-lived (common name: "Dayflower") bisexual flowers are often blue or purple. They generally have three-fold symmetry, with three green sepals, three petals, six or fewer stamens and often three locules in the superior ovary which develops into a capsule. Many species have hairy stamen filaments. Nectaries are absent and the flowers do not produce nectar. 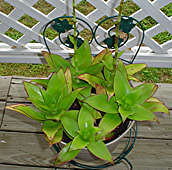 Many species are cultivated for decorative effect as garden ornamentals or houseplants and this is their main commercial use. Most species are easily propagated from cuttings. This genus includes around 20 species of trailing and semi-upright plants with semi-succulent triangular leaves whose bases form a sheaf around the stem which in usually fleshy, jointed and trailing. In some species the leaves have longitudinal variegation and purplish undersides. The typical inflorescence is a hairy stalk with small alternate flowers composed from three sepals and three petals. The genus is native to the New World tropics and warm temperate zones. Some members of the genus may cause allergic reactions in cats and dogs. This tolerant Mexican succulent plant produces long flower stems with fragrant white to pale pink flowers arranged in clusters of three. 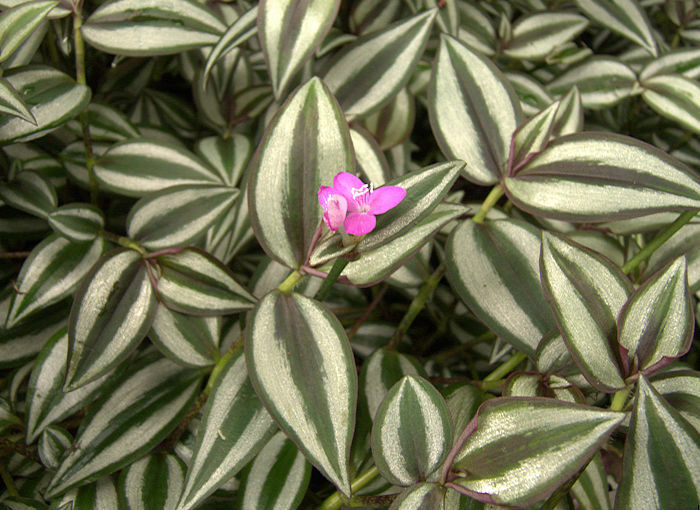 The waxy leaves colour up in full sun with purple markings, especially leaf margins. In poor light the plant becomes flabby and elongated. Rosettes root easily to make new plants. Good for hanging baskets or ground cover in mild climates but will not tolerate significant frost. Various variegated cultivars may be seen. Widely cultivated for supposed cure-all properties, especially in Russia. A creeping Callisia whose stoloniferous succulent stems form a large mat. growing about 3 miles South of Marathon, Texas, where it was fairly common on the road margins. This mostly non-succulent plant has a tuberous root, perhaps explaining its tolerance of hot, dry conditions. It is widely distributed throughout the Americas and Africa. 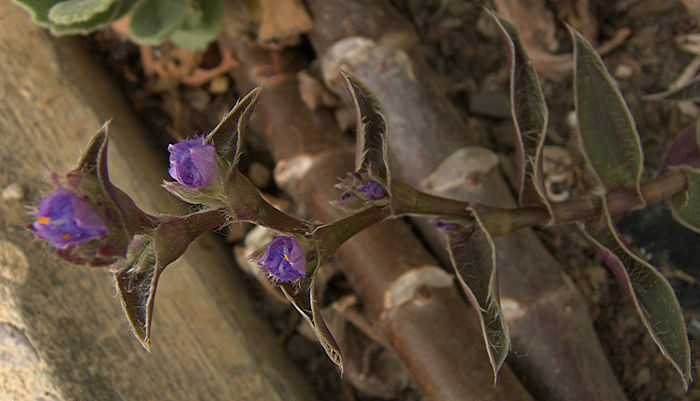 A trailing plant with a succulent stem and markedly hairy, triangular leaves forming a basal sheath around the stem. The flowers in the leaf axils have blue petals with white marginal hairs. In some forms, the stoloniferous stem arises from a basal rosette. A genus of about 25 species of medium-sized shrubby plants with showy zygomorphic blue and purple flowers with large anthers releasing pollen by means of apical pores. Seeds are embedded in a red or less frequently a white aril. Roots are tuberous. Native to warm climates in South America and Mexico. Stems and leaves are traditionally used to treat burns and snakebites. The erect stems of this shrubby plant grow up to 5 - 6 ft tall with large sword-shaped leaves arranged around the stem. 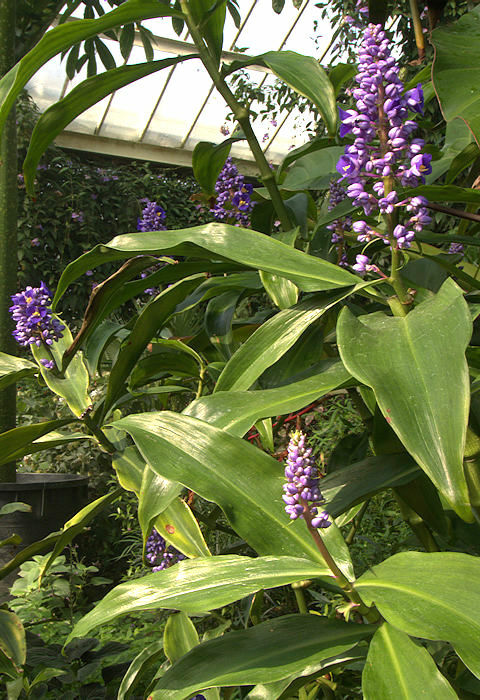 The inflorescence is a dense branching raceme of purple-blue flowers with yellow stamens and style. 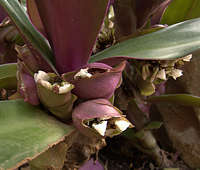 The foliage is killed by any degree of frost but may resprout from the rhyzomatous roots if these have not been damaged. 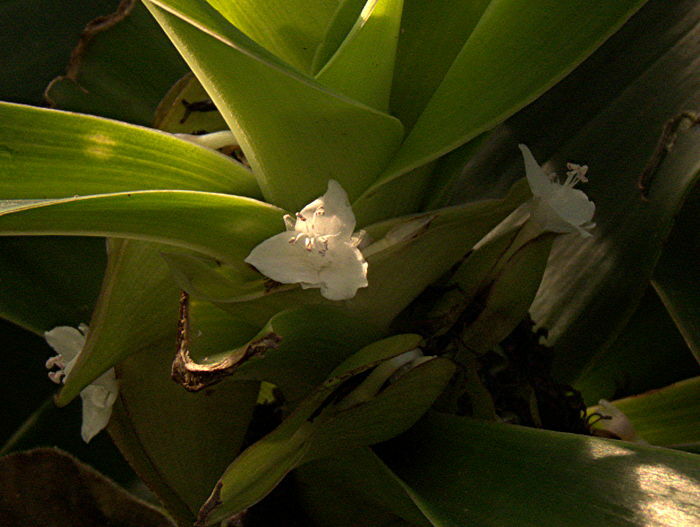 Native to tropical forests of Brazil and Peru and requires constant moisture and humidity. This is the type species for the genus. Named for: John Tradescant the elder (ca. 1570 - 15-16 April 1638) English naturalist & gardener. This New World genus includes around 70 species of perennial or short-lived herbs, many of which are tender trailing succulent species with thickened stems, some with fleshy and hairy leaves. They are easily propagated by cuttings and generally tolerant of conditions, but bright light will maintain a compact habit, good leaf colour and leaf hairs if present. 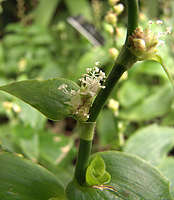 Some Tradescantias have blue stamen hairs which change color to pink though somatic mutation when exposed to low levels of ionising radiation. This is one of the few effective bio-assays for low doses of radiation. 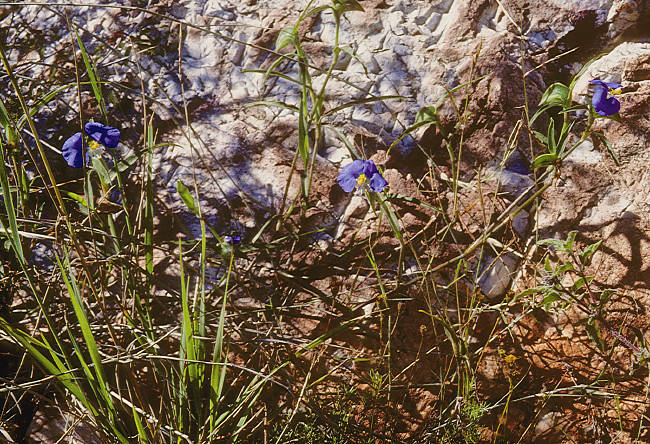 This fleshy succulent Tradescantia was growing in full sun on rocks in the baisin area within the Chisos Mountains of the Big Bend National Park, Texas. 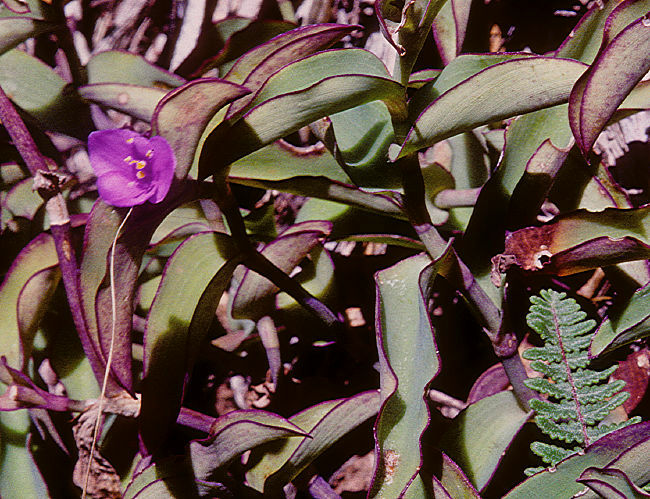 Where growing in full sunlight, leaf margins and stems were bright purple and the growth habit was compact, but on the shaded (South) side of the canyon plants had mainly green leaves and longer internodal stem segments. 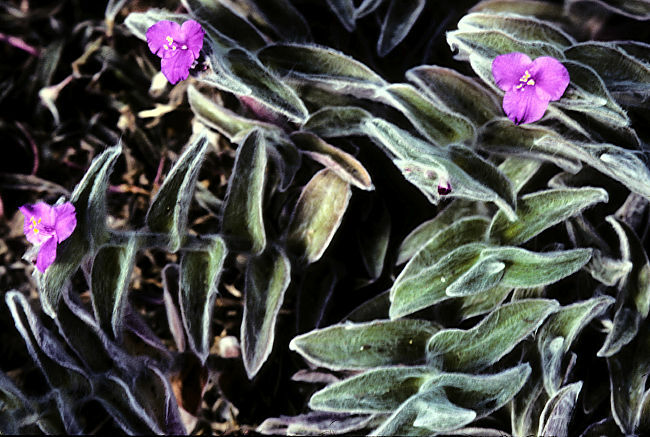 This scrambling succulent perennial has long pointed purple-green leaves and small pink flowers with three petals. Native to the Gulf coast of Mexico, but naturalised and invasive in Florida and Australia. 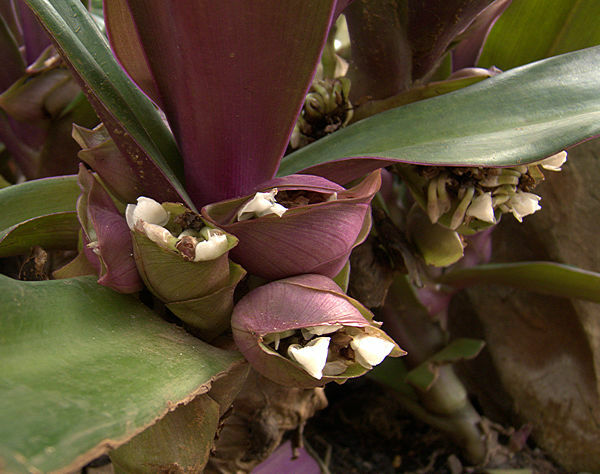 As a houseplant, T. Pallida is said to improve air quality by scavenging volatile organic compounds. Propagation from stem cuttings is easy. 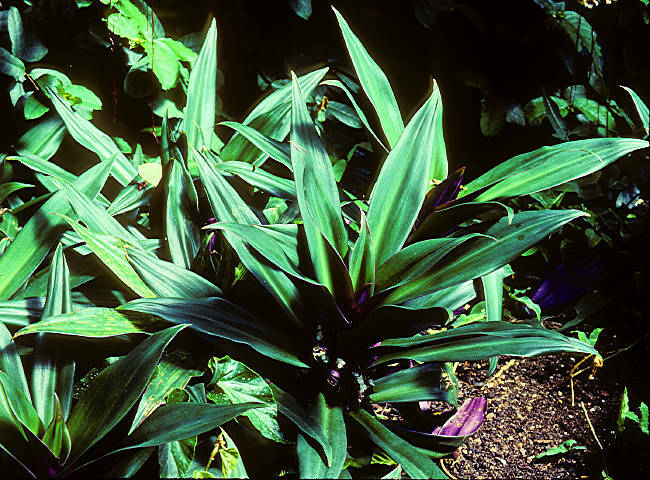 Tradescantia pallida var purpurea is an especially-purple cultivar. 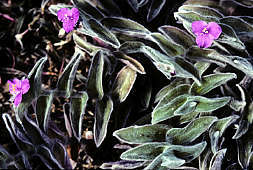 is a showy trailing succulent plant with markedly hirsute leaves and a typical 3-petalled purple flower. It originates in the mountains of Northern Mexico so tolerates cool, frost-free winter conditions if kept on the dry side. Selected cultivars with pure white leaf hairs are available in the horticultural trade. 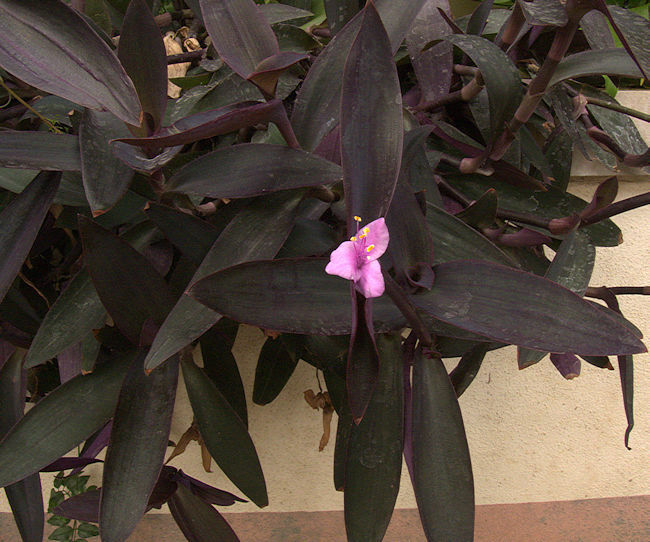 This erect shrubby succulent plant has large sword-shaped dark green leaves with purple undersides. The small white three-petalled flowers are produced in boat-shaped purple bracts hidden in the leaf axils. 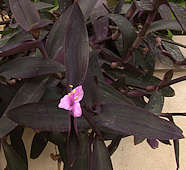 Tradescantia spathacea originates in the West Indies, Mexico, and Central America especially around Mayan sites, but has become naturalised in other warm climates. It is listed as an invasive species in Florida. 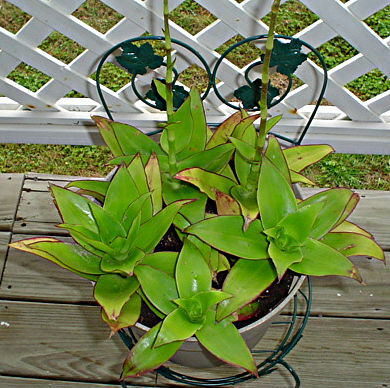 This plant is commonly used in decorative displays or as a feature plant for a large pot. 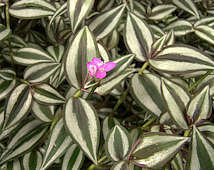 Cultivars with longitudinally-striped leaves are available. 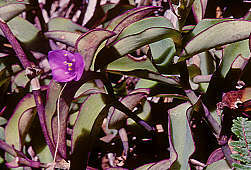 Left: Tradescantia spathacea forma concolor. This form lacks the purple pigment in its leaves and bracts. 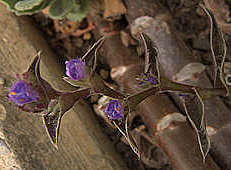 This scrambling perennial succulent has pointed oval leaves, striped with purple-green and silver on their upper surface and with uniformly purple undersides. The small pink flowers have three petals. Native to the Gulf coast of Mexico and naturalised in e.g. Florida. 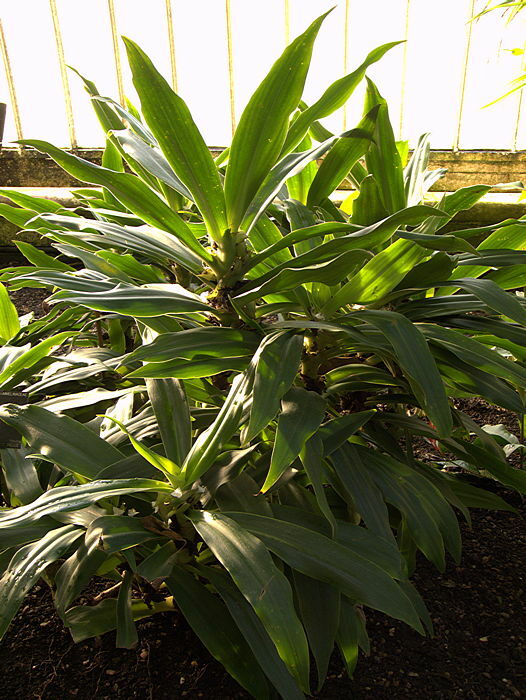 Cultivars of this plant are widely used as houseplants and are easily propagated by stem cuttings. 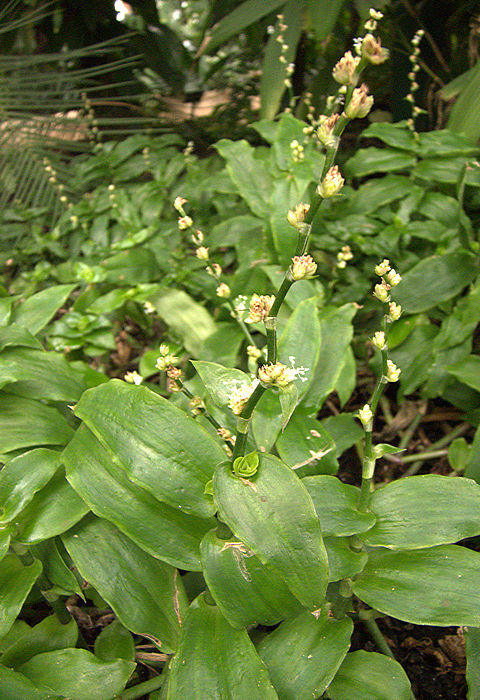 In warm climates it is used as a dense ground cover but has the potential to become invasive. In Mexico it is used as a herbal tea. However, prolonged contact with the sap may cause skin irritation.